An updated and complete listing of Newtown and Yardley public schools, private schools, pre-schools,educational programs and services, SAT/ACT prep, recreational activities, after-school activities, informative articles, business listings, open houses, kids party ideas, schools from the surrounding area, helpful links, and more! Stuart is an independent K-12 school in Princeton, founded in 1963, just for girls. We believe that in developing the mind, body and spirit together, a Stuart education produces young women leaders who think critically, creatively and ethically. Our challenging curriculum takes advantage of the way girls learn in the STEM fields of science, technology, engineering and math—as well as the arts, humanities and athletics. Stuart graduates go on to become confident, intelligent and articulate agents for positive change in our world. Girls may enter Stuart at all grade levels, depending on space availability. We also have a co-ed preschool and junior kindergarten program. Visit www.stuartschool.org for more information. This new school targets the population of early learners who show clear signs of dyslexia. We provide a safe, supportive environment for students. Using expert teachers, we use essential research-based multi-sensory teaching methodologies which include Orton-Gillingham, Wilson Reading System®, and others. A range of creative and assistive technologies are integrated into the curriculum, such as iMovie, GarageBand, Kurzweil, Inspiration@ Software, Dragon Dictation and others. The Newgrange School in Hamilton, NJ (a state-approved school for students with disabilities) and the Newgrange Educational Center in Princeton have provided educational services for dyslexics since 1977. Newgrange’s Executive Director, Dr. Gordon Sherman, is internationally recognized for his contributions to the field of brain research, teaching methodologies, and service to the dyslexia community. Princeton Day School's mission is to nurture the mind, the body, and the character of each student. Our coeducational, college-prepatory day school offers students a creative and challenging academic experience within an intimate, supportive learning environment. The classes are small and instruction personalized, and the school itself creates a strong sense of community. We enroll approximately 950 students from PreK through twelfth grade, and are located on a 106-acre campus two miles from the center of Princeton. Please contact us for information about our application process and our strong need-based financial aid program. Opportunities of a Lifetime. Every Day. Solebury School is a coed, college preparatory, boarding and day school, for 235 students in grades 7-12. Students may board beginning in 9th grade. Our small size, the individual attention we give our students and the deep mutual respect between faculty and students are the cornerstones of our success. Honors and AP courses, an ESL program for International students, a Learning Skills program, and a full range of arts, athletics and activities make our program distinct. Solebury's beautiful 90-acre campus is located on Phillips Mill Road, two and one half miles north of New Hope, in the heart of historic Bucks County, Pennsylvania, mid-way between New York City and Philadelphia. George School is a Quaker, co-ed boarding and day school for students in grades 9 to 12. Located on a beautiful 240-acre campus, George School is an experienced leader in education, offering the International Baccalaureate (IB) diploma program and an array of advanced placement (AP) courses. Whether through robotics, stagecraft, ceramics, or philosophy, students are challenged through a rigorous yet personalized curriculum. Students participate in athletics and physical wellness classes in state of the art facilities, and we also offer an equestrian program. Our goal is to inspire our students to seek their authentic selves and to provide them with a well?rounded preparation for life. George School graduates enter the world confident and capable leaders rooted in self-awareness, self?sufficiency, and the ability to listen deeply to others. With our comprehensive college counseling program, our graduates attend the most selective colleges and universities worldwide. The Bridge Academy is a private, non-profit school approved by the state of New Jersey for students with language-based learning disabilities such as dyslexia, dysgraphia, auditory processing and ADHD. It is the only accredited Orton-Gillingham program in New Jersey. The school serves students ages 8-18 of average or higher intellectual potential and strives to empower students to bridge the gap between potential and performance. The Bridge Academy uses research-based, classroom-proven techniques taught by experienced professionals to help students thrive in school and achieve academic success. A summer program is also available. Currently 68 students are enrolled from 24 different school districts in New Jersey and from nearby towns in Pennsylvania. Please call 609-844-0770 or www.banj.org for more information. The Pennington School is an independent, coeducational school for 520 students in grades 6 through 12, with both day and boarding programs. The current student body represents over 40 countries, and about 30% receive financial assistance. The challenging and innovative curriculum is college preparatory, with a strong emphasis on fostering the development of the whole student through academics, athletics, community service, and the creative and performing arts. Pennington offers two, two-year special certificate programs in Global Studies and Applied Science. There are also small, selective programs for international students and for bright students with language-based learning differences. Faculty members are noted for their dedication to the learning process of all students, and for honoring the varied perspectives of the diverse student body, which contribute to the entire educational experience. Chapin School welcomes students who are curious, engaged learners whose families value our belief that lifelong habits of mind and heart are formed in the elementary and middle school years. 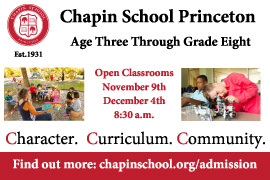 Chapin provides a richly textured education that inspires academic achievement and builds strength of character. At Chapin, all of our efforts and resources are dedicated to early childhood, elementary and middle school learning experiences that are the foundation of future success. We believe this focused approach gives our students advantages by providing more leadership opportunities in developmentally appropriate ways, inspiring them to take academic risks, and develop their sense of community. The Chapin "C's" become an intrinsic part of each Chapin student through a continual focus on Character, Curriculum and Community. The French American School & International Middle School is an independent school offering a bilingual education from Preschool (3yrs old) through 8th grade. Students, families, staff and teachers at FASP come from around the world, and is one of the most nationally, culturally, and linguistically diverse if not the most diverse school in the Princeton and Bucks County area. Learning in a bilingual environment is a valuable asset in a society where communication is essential. Being exposed to many cultures and learning to respect them is a formative experience for children in a world where cultures are more than ever in contact. Learn why bilingual education will set your child on the right path to thrive in tomorrow’s world. New Hope Academy specializes in motivating and educating school-phobic students, at-risk teens, gifted students, those with IEPs, and students who just feel that they do not "fit" in their schools. NHA provides the least restrictive learning environment for students who do not thrive in traditional high schools or traditional "alternative" schools. Students with IEPs are placed in appropriate academic level classes, supported by our certified Special Education Department staff, and given the necessary resources to achieve the goals described by state standards and the students' IEPs. For 18 years, New Hope Academy has helped students to have a more positive mindset, where they strive for excellence and a lifetime of achievement. Call 215-493-4200 or visit www.newhopeacademy.net. Founded in 1963 by the Grey Nuns of the Sacred Heart, Grey Nun Academy is an independent, Catholic, co-educational elementary school in Bucks County, PA for children grades PreK3 through 8th grade. The Academy's mission is to offer an academically rich curriculum that meets the unique needs of individual students, respecting the rights, interests, and dignity of each child. GNA welcomes children of all faiths and cultures. The school's educational process leads children to embrace and promote peace and social justice in our world. Grey Nun Academy is a member of the National Association of Independent Schools (NAIS) and Pennsylvania Association of Independent Schools (PAIS). For more info visit: www.greynunacademy.org Application requirements: contact Lisa Grabowski, Director of Enrollment at 215-968-4151. Get rolling into Fall with Dynamix Gymnastics - registration is now open! NEW in Bucks County, Dynamix Gymnastics, in Langhorne, PA, conveniently located right off of Rt 1 and 95. The trained staff are dedicated to teaching your children the principles of Gymnastics and developing their coordination and motor skills. Gymnastics will not only increase your child's physical abilities, they will also learn life skills such as perseverance, discipline, commitment, teamwork, and leadership. We focus on learning technical gymnastic skills in addition to building self-esteem, goal setting, trying new things, overcoming fears and working hard. We start at 16months and offer the following programs: Pre-Gym ages 3-5, Recreational classes for Girls and Boys ages 5+, Tumbling, Gym Ninja Classes, Competitive Gymnastics Team, Kids Night Out, Clinics, Schools Out Camps, Birthday Parties, and Open Gym. Buckingham Friends School (BFS) is a coed Quaker school for full-day kindergarten through grade 8. On its 44-acre wooded campus in Lahaska PA, students have time for exploration and creative play. Quaker values are woven throughout the program with an emphasis on collaboration, exploration, and experiential learning. At BFS, students are encouraged to think deeply, reflect thoughtfully, resolve conflicts peacefully, and play exuberantly. As a result, they are known for their confidence, their self-possession, and their ability to articulate their thinking both orally and in writing. Signature programs include rich arts offerings - art, wood-shop, music, and theater. Since 1991, BFS has been part of a cross-cultural and international JEM (Joint Environmental Mission) program with partner schools in Russia, India, China, Australia, Ecuador, Hawaii, Kenya and France.